Esmark Finch is part of the “Digital Packaging Partnership – by Xerox” a group of leading European Cartons Manufacturers. 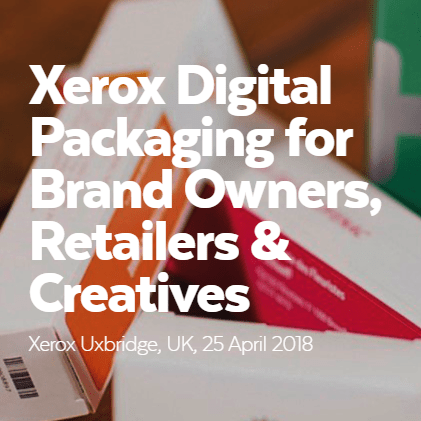 They will be running a Digital Packaging Event on Wednesday 25 April 2018 at the Xerox Innovation Centre in Uxbridge, UK. Those attending and speaking will be Brand Owners, Retailers and Creatives seeking new technologies and services in the folding cartons space to help them grow Brand Visibility and Customer Loyalty. Trends & Insights: Discuss global packaging trends & insights and see how the market is responding to the demands of the global supply chain in the folding cartons space. Voice of Brand Owners & Converters: a keynote speech will be delivered by Brian Stow of Mars Wrigley Confectionery who will discuss ‘The complex journey to understand Digital Print challenges and innovation opportunities to grow a Global FMCG business.’ We will also share high value folding cartons applications through hearing from the “voice of the brand owners” and the experience from digitally skilled packaging converters. Science of Consumer Buying: Hear from a Neuro-Marketing Scientist how packaging influences consumer buying behaviours and how you can maximize the opportunities – discussion with Phil Barden, Managing Director of ‘Decode, Implicit Marketing’ (UK). Digital Packaging: New Technologies and Services – you’ll see for yourself how digital printing as well as new technologies & services can help you bring much more value to your cartons and streamline your folding cartons supply chain. The event is run in Partnership with: The Alexir Partnership – UK, Dailypack – France, De Budelse – NL, Esmark Finch Ltd – IRE, Qualvis Print and Packaging – UK.